Spirit Sign with NeoPixels! #WearableWednesday « Adafruit Industries – Makers, hackers, artists, designers and engineers! Thanks to Calvin for writing in to share this nice sign project with us! It might not technically be a wearable but it’s still a nice portable way to show some school spirit. Here is a project I made with parts from adafruit. It is not a wearable but it is a portable. This was made for the University of Dayton Lady flyers for the cheer squad. It is a sign they can take to the games and show off their spirit. Lithium Ion Polymer Battery – 3.7v 1200mAh, and Adafruit Micro Lipo – USB LiIon/LiPoly charger – v1, ½ a foam core filled pasteboard some color duct tape. Size of the sign is 14” X 20”. 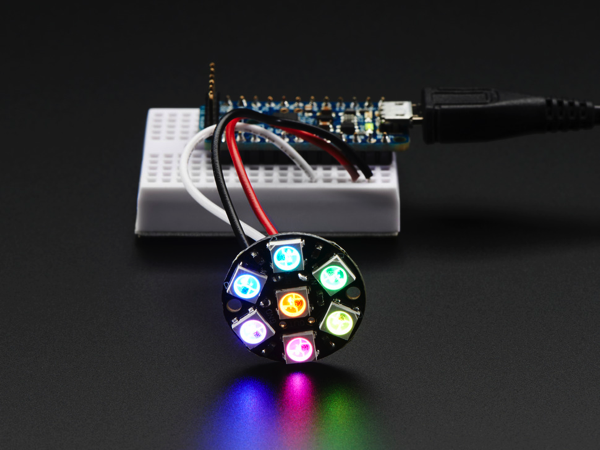 NeoPixel Jewel – 7 x WS2812 5050 RGB LED with Integrated Drivers: Be the belle of the ball with the NeoPixel Jewel! We fit seven of our tiny 5050 (5mm x 5mm) smart RGB LEDs onto a beautiful, round PCB with mounting holes and a chainable design to create what we think is our most elegant (and evening-wear appropriate) NeoPixel board yet. Read more. 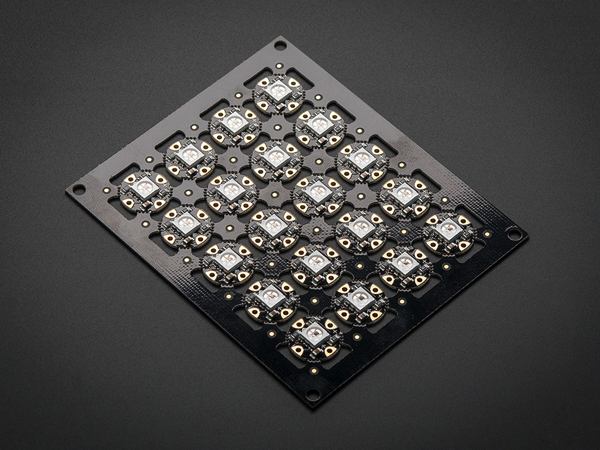 Flora RGB Smart NeoPixel version 2 – Sheet of 20: So, you want lots and lots of NeoPixels? And you want them for less? Not a problem! Here’s a sheet of Flora NeoPixels fresh from the (reflow) oven. Cut them off as you need ’em and save a pretty penny while you’re at it. Read more.